Go to original pattern for design DROPS 103-20. DROPS jacket from the 60ies with round yoke and ¾-long sleeves in ”Silke-Alpaca” and ”Vivaldi”. Size S to XXXL. 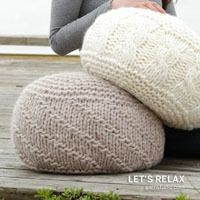 – or needle size needed to make 15 sts x 20 rows in stockinette stitch with 1 thread of each quality on 10 x 10 cm [4’’ x 4’’]. 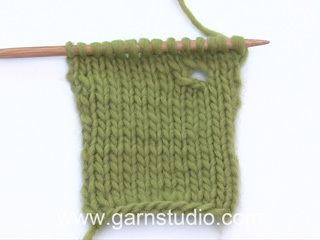 Garter stitch: Knit all rows back and forth on needle. Button holes: Cast of for button holes on right front band. 1 button hole = cast of 4th and 5th sts from edge and cast on 2 new sts over the boun off sts on next row. 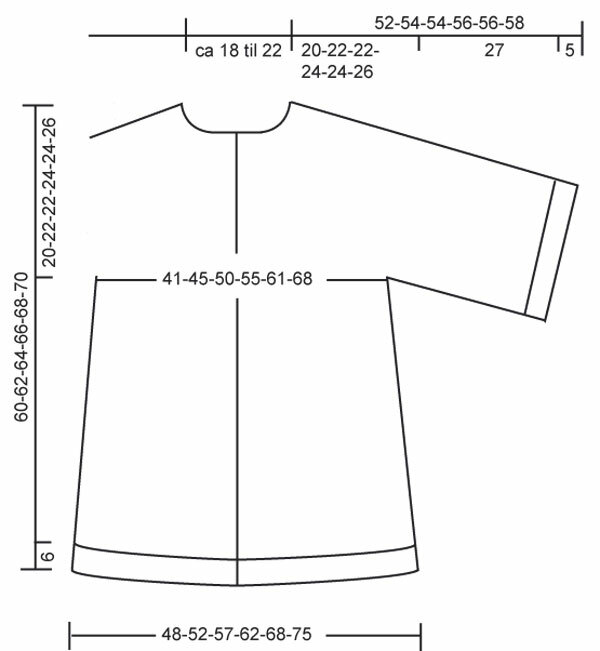 Size XXXL: 30, 40, 50, 60 and 70 cm [11 ¾”-15 ¾”-19 ¾”-23 5/8’’-27½”]. 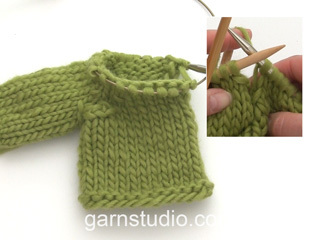 Note: bind off for the last button hole after 4 rows in garter st on neckband. Decrease tip (applies to dec in sides): Dec 1 st on each side of every marking thread. All dec are made from RS! Dec before the marking tread: K2 tog. Dec after the marking tread: K2 twisted tog (i.e. Knit in the the back loops instead of in the front). 1st row: K from RS. 2nd row: P from WS. 3rd row: K from RS (dec on this row). 4th row: K from WS. Front- and Back piece: Knit back and forth on a circular needle from front edges. Cast on 144-156-170-186-204-224 sts on circular needle size 6 mm [US 10] with 1 thread of each quality. 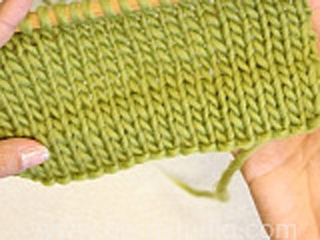 Work in stockinette stitch for 5½ cm [2 ¼”], cut the thread. Cast on 7 new sts in beg on needle (= front band), K all sts on row and cast on 7 new sts in the end of row (= front band) = 158-170-184-200-218-238 sts. K1 row on WS (= fold) – continue to measure from this point onwards! Continue in stockinette stitch - but the 7 edge sts in each side works in garter stitch to finished measure. When piece measures 6 cm [2½”] K1 row on WS over all sts (this is the row the lining is sewn to). Continue in stockinette stitch and front band in garter st. Place 1 marking thread 43-46-49-53-58-63 sts in from each side (marking the sides). When piece measures 10 cm [4’’] dec 1 st on each side of both marking threads – read Dec. tip: dec every 5-6-6-6-7-7 cm [2”-2 3/8”-2 3/8”-2 3/8”-2 ¾”-2 ¾”] a total of 5 times = 138-150-164-180-198-218 sts. At the same time when piece measures 20-22-24-26-28-30 cm [8”-8 ¾”-9½”-10 ¼”-11”-11 ¾”] bind off for button holes along right front band – read explanation above. 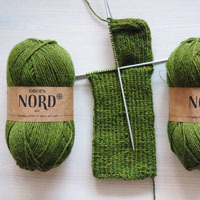 When piece measures 40-40-42-42-44-44 cm [15 ¾”-15 ¾”-16½”-16½”-17 ¼”-17 ¼”] bind off 6 sts in each side for armholes (i.e. 3 sts on each side of both marking threads) = a total of 126-138-152-168-186-206 sts remaining on needle. 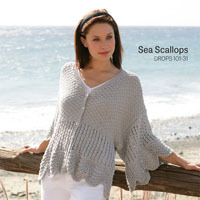 Put piece a side and knit sleeves. Sleeve: Knit in the round on double pointed needles. 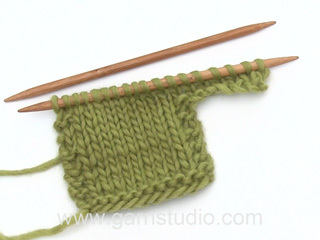 Cast on 54-56-58-60-62-64 sts on double pointed needles size 6 mm [US 10] with 1 thread of each quality. Work 4½ cm [1 ¾”] in stockinette stitch, then P1 row (= folding row) – continue to measure from this point onwards! Work 5 cm [2’’] in stockinette stitch and then P1 row (the lining is sewn into this row). Continue in stockinette stitch. When piece measures 32 cm [12½”] bind off 6 sts under the sleeve = 48-50-52-54-56-58 sts. Put piece a side and knit another sleeve. Shoulder piece: Put sleeves on same circular needle as front- and back piece where there are openings for armholes = 222-238-256-276-298-322 sts. Continue with Pattern – see explanation above (front bands as before). At the same time dec for round yoke. Dec 12-12-13-13-14-15 sts evenly distributed on the 3rd row in pattern (do not dec over sts on front bands). Repeat 1st-4th row in pattern a total of 11-12-12-13-13-14 times. After all dec remains 90-94-100-107-116-112 sts on needle. K1 row from RS at the same time as dec 18-18-20-23-28-24 sts evenly distributed (do not dec over sts on front bands) = 72-76-80-84-88-88 sts. Now starts the neckband. Knit 5 cm [2’’] in stockinette stitch, front bands in garter stitch (bind off for the last button hole after 4 rows in garter st). After 5 cm [2’’] K1 row on WS over all sts, and then bind off the 7 sts on front bands in each side. Work 4½ cm [1 ¾”’’] in stockinette stitch over the remaining sts, and then bind off. Assembly: Sew openings under the sleeves. Fold lining on sleeves and front piece towards WS and sew with small stitches. Fold neckband double toward WS and sew. I have been looking for a pattern like this everywhere. Can't wait for this one. Alt for højhalset efter min smag. Men den går lige an. Gillar denna. hoppas den kommer ut på nätet. Jag tror inte denna är så fel egentligen, bara fotad i dålig vinkel. Framifrån hade varit bättre, bra design.